Interesting bike in correct color! Will it get a front brake? The rear brake tends to early blocking even on dry roads. Would not like to imagine how to get this bike stopped on a bumpy, wet road, moreover with a hard tail. Is the rear chain guard residual really just fixed with a single bolt? If yes, I would expect trouble with time. Did you modify the stock Custom 4-4 or is this a completely different exhaust? The head oil leak is quite typical, mostly caused by the O-rings. Nothing dramatic, just a bit a mess. If you like to care for it and try out something, you may have a look at the An idea for the head oil leak thread. scummydan wrote: its a bit modified and the rear wheel i got rid of the drum and put in a disc it stops really well in dry conditions but yah im sliding all over the place and gearing down alot in the wet. Now my view of the world is all right again. Great job...where did you get the bike b4 you choped it and for how much, how long did it take, give us some back ground basically on the bike? 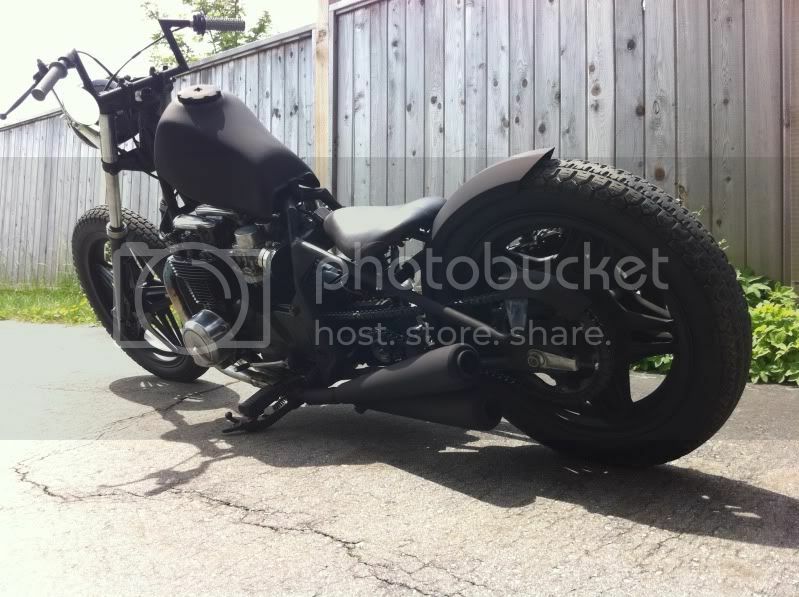 Nice Bobber like the rear fender looks cool.. Cool Idea, I like it. I am in the process of bobbing a 79 650 too. Could you post some more pcitures of the bike? 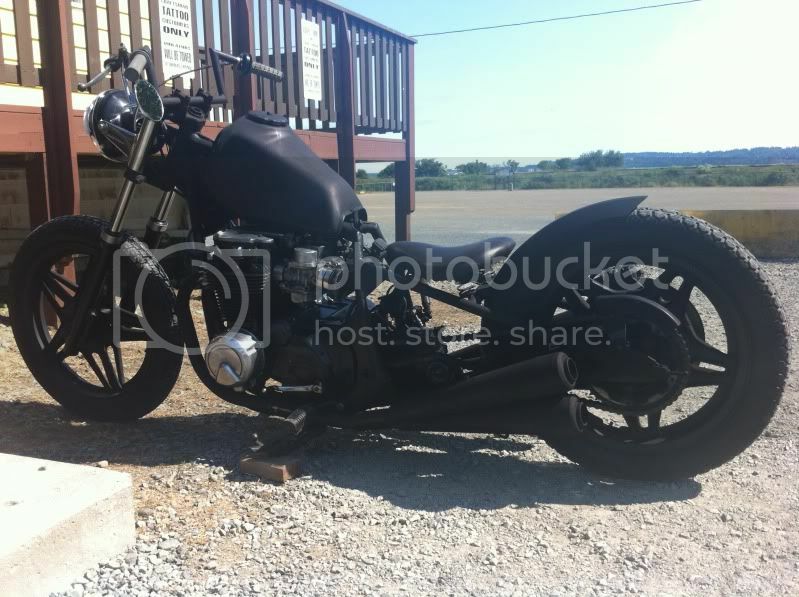 I like the gas tank, looks like it came off a early-mid 80's enduro or woods bike. What kind of tires did you use? any modifications to your electrical? Guess you will collect lots of stones between the cylinders with that front tire thread and without fender. Clutch wrote: any modifications to your electrical? Looks like cut off everything but starter, ignition and headlight. Battery and RR seem behind engine. That looks really nice...Im not sure if my photo will go through, this is my 80 cb650c i got when he passed in 98, he bought in 81, ive now took an affection for it, seem I've customized everything ive ever owned since i got my 1st harley at 16 (now 44) i couldnt leave it almost stock. In last year i started chopping on it took a break an recently fabbed up a new hardtail back half (utilizing the swing arm) cut everything off it it didn't need, added sporty tank,bates headlight an old unused flat fender from an old project. I pulled the mufflers off the big 4 into 2 turnouts now it just looks like 2 into 1 header on each side. The expensive mod is the cost of replacing the OEM ign, ive seen the hei swap but ahhh i duno, i like simplicity of the dynatek system but its almost $500! 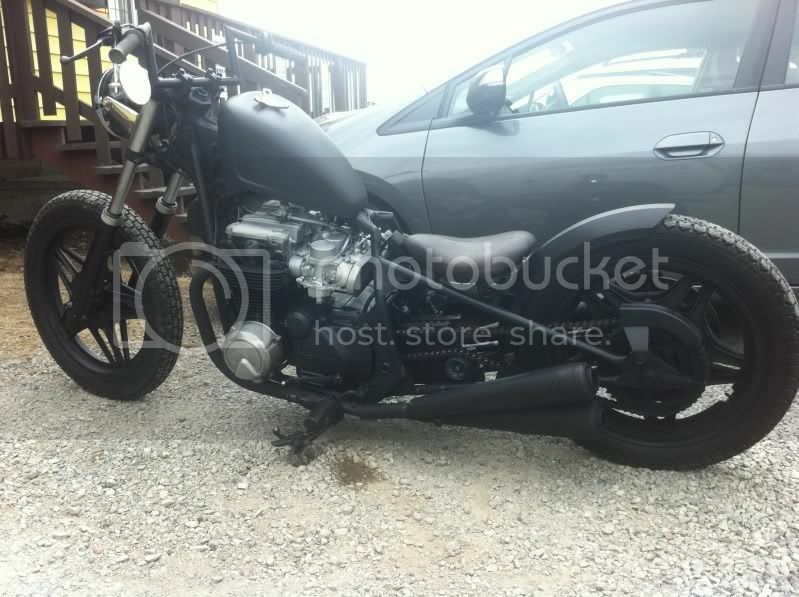 But im getting more attached to it every day and can't wait to get it all finished and take it out for a spin!